Timon is one of the characters from The Lion King, Timon and Pumbaa, the film's sequel, and its parallel. Timon is the best friend of Pumbaa and the protector of Simba when he was little. Inspired by the idea of having a major predator on their side, he and Pumbaa took Simba in when he collapsed of heat exhaustion after his father's death. He was voiced by Nathan Lane in the trilogy films, Kevin Schon in Timon and Pumbaa and House of Mouse, Quinton Flynn in some of the Timon and Pumbaa episodes, and Bruce Lanoil in the Wild About Safety shorts. 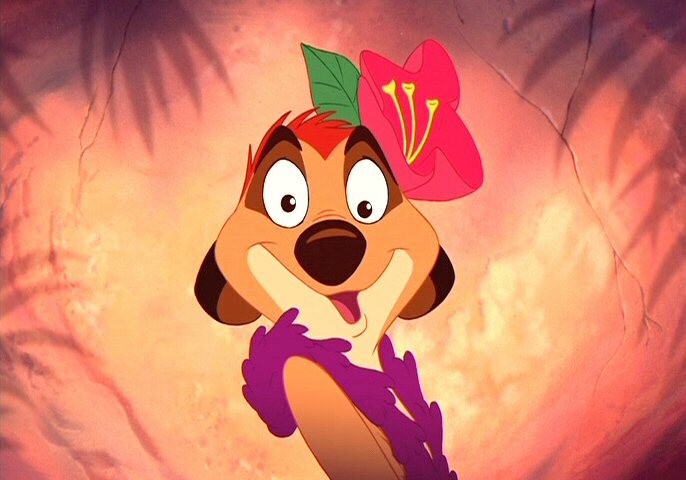 For most of the time, Timon is comical, and is wisecracking. However, Timon seems to be selfish, but he shows a lot of heart as shown in the final battle of The Lion King where after he and Pumbaa distract the hyenas so Simba could encounter Scar at Pride Rock. Timon is not as smart as he thinks he is as he takes Pumbaa's ideas as if it is his own. Timon is a wisecracking, comical meerkat who is best friends with Pumbaa. When growing up in a colony of meerkats, far from The Pridelands, he is not skillful at digging tunnels unlike most of his fellow meerkats, and while on sentry duty, he resorts to daydreaming. 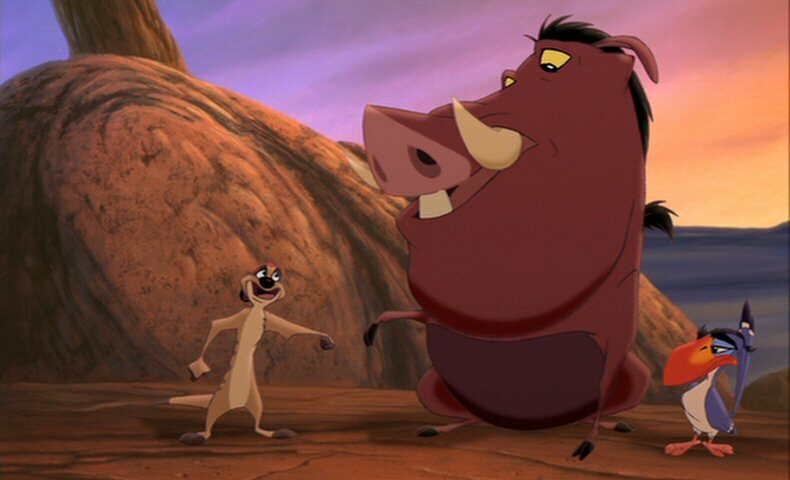 After the success of The Lion King, Timon and Pumbaa were given their own spin-off TV series, which ran for 86 episodes between September 1995 and November 1998, and occasionally had cameos of other Lion King characters. 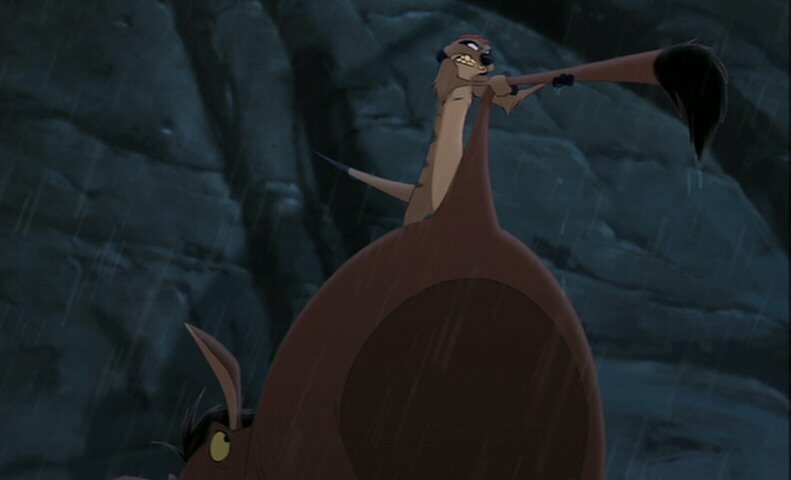 In the film, Timon is seen riding on Pumbaa's back when trying to rescue young Simba from buzzards. At first reluctant, Timon decides to take Simba in and they revive him. When Simba recovers from his exhaustion, he walks off and thanks them. But, Timon and Pumbaa follow him and question his background. When Simba tells Timon about his troubles, Timon teaches the young cub to the philosophy of "Hakuna Matata" (Swahili for "no worries"). He, along with Pumbaa, teaches Simba to eat grubs instead of his usual diet consisting of zebras, antelopes, and hippos. When Simba fully matures into an adult, he gazes out at stars with Pumbaa and Simba. After Simba talks about his theory of stars taught by his father earlier in the film, Timon mocks his theory and calls Mufasa indirectly a "mook". Days later, he is singing with Pumbaa "The Lion Sleeps Tonight" until he notices Pumbaa has ran off to chase a beetle. When Timon hears his friend screaming, he finds Pumbaa stuck in the grasp of a tree root and sees Nala ferociously chasing after them. They are rescued by Simba, and after the fight between Simba and Nala, he is shocked that Simba and Nala made up so quickly. After he meets Nala and learns that Simba was to be a king, Simba tells him and Pumbaa to leave so he can catch up with Nala. Seeing Simba and Nala embrace each other, Timon fears that his companion’s friendship with him and Pumbaa will be over through singing the opening verse and the ending verse (with Pumbaa) of "Can You Feel the Love Tonight". The next morning, Timon is awakened by Nala who questions him and Pumbaa about where Simba is. When Rafiki tells him, Pumbaa, and Nala that Simba is going back to the Pridelands, he learns more about Simba's backstory through having a conservation with Nala. He finds Simba with Nala, and he agrees to help Simba win back his rightful place as king. When they are close to Pride Rock, Simba calls for Timon to find a way to distract a group of hyenas crowding Pride Rock. At first reluctant, but he agrees to it and sings a hula song with Pumbaa which gets some hungry hyenas to follow them clearing the path for Simba to encounter Scar at Pride Rock. He is finally seen during the climatic battle seen at Pride Rock. When Shenzi, Banzai, and Ed chase him into the den of Pride Rock, he runs inside the birdcage which Zazu is held captive. 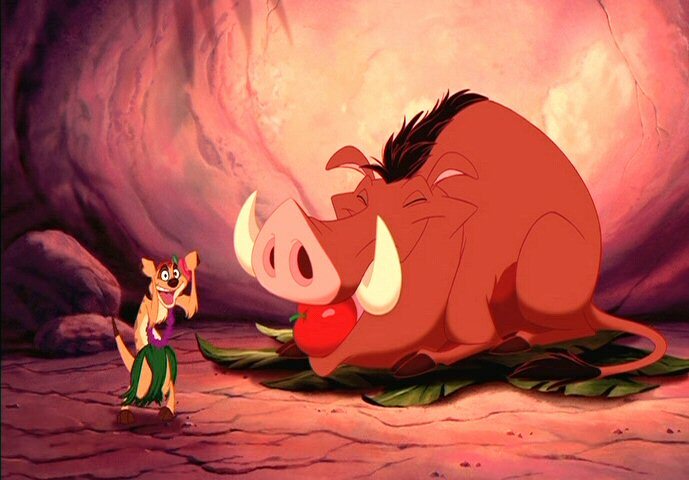 When Banzai calls Pumbaa a "pig", he tells them that they are in for it and successfully beats off the hyena trio. 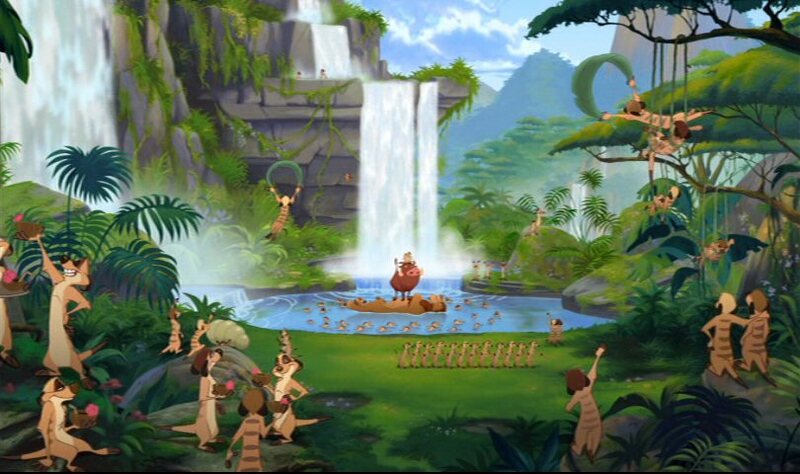 After Simba and the Pridelanders defeat Scar and the hyenas, he witnesses Simba taking back his rightful throne and is seen waving his hands in a classic victory sign during the presentation of Simba and Nala's newborn cub. After Kiara is presented to the animals at Pride Rock, Timon assumes Kiara is male and tells Pumbaa about the adventures they will have. He faints along Pumbaa when Rafiki corrects them by telling them that Kiara is a girl. Months pass and Kiara becomes a young, playful cub. When Kiara runs off to play, Simba instructs him and Pumbaa to watch over her so she doesn't get hurt or cause trouble. They find Kiara, but she eventually runs off when he and Pumbaa begin to debate over bugs. Zira roars at Timon and PumbaaAdded by Werebereus Timon is seen again when Zira encounters Simba and tells her to get out of the Pridelands. But, Zira frightens him when she roars at him. Timon also remarks in the conservation calling Kovu a "fuzzy maraca". After the conservation, Timon along with Pumbaa, Nala, and the Pridelanders head straight back to Pride Rock while Simba stays behind to scold at Kiara. Years later, when Kiara matures into an adult, Simba again instructs him and Pumbaa to make sure she doesn't get hurt. When Kiara finds Timon, she questions his presence and Timon tells her that he is shopping for various items for the den. Kiara realizes he's lying and runs away again. He along with Pumbaa tries to go after her, but they lose her. The next morning, when Kovu is teaching Kiara how to hunt, Kovu accidentally runs into Timon. Timon, frightened, thinks he is going to eat him. But, when Kiara appears, he enlists the help of the lions to scare off the birds from taking their feeding grounds. It soon turns into a game until they run into a herd of rhinoceros that chase them the opposite way. When Simba is injured from the ambush by Zira and the Outsiders, he along with Pumbaa, Kiara, and Zazu find and assist him back to Pride Rock. 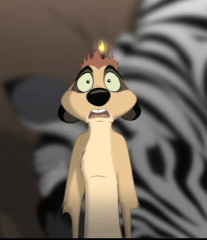 When Kovu comes to apologize for the ambush, Timon is quick to blame him and comically wants "to get at him". Soon after that, Timon fights alongside Simba and the Pridelanders after Zazu warns Simba that the Outsiders coming to the Pridelands to fight. When some Outsiders surround Timon and Pumbaa during the battle, he comically uses Pumbaa's tail as a shotgun and scares them off. Finally, after the battle is over, he looks alongside Pumbaa and Zazu when Simba, Nala, Kovu, and Kiara roar on top of Pride Rock. The film begins by explaining Timon's backstory in which he lives in a meerkat colony far away from Pride Rock and is hated by his fellow meerkats for destroying their tunnels every week. Unable to fit in, Ma, who always tries to make Timon's hair look neat, tries to get his son to be on sentry duty. Timon is mentored by Uncle Max who teaches him to "scurry, sniff, flinch". While on guard, he starts doing the exercise until he starts singing "That's All I Need". When he finishes singing, the hyenas appear and push him aside to infiltrate the meerkat colony. The hyenas repeatedly try to eat meerkats, but they escape into their burrows except Uncle Max who escapes being eaten. 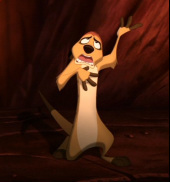 As a result, Timon loses favor among his colony and leaves to go find his place in life. While on the journey, he meets Rafiki and teaches him "hakuna matata". 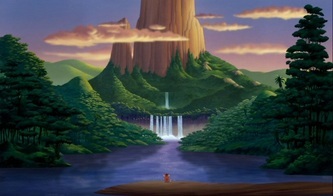 Also, he tells the meerkat to "look beyond what you see" and assumes his dream home is Pride Rock. He later meets Pumbaa and uses him to protect him from predators. 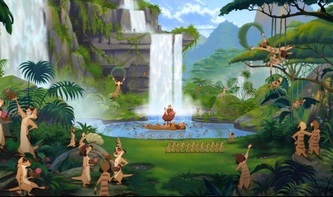 When he arrives at Pride Rock, he and Pumbaa find the animals gathered to see Simba. With the option of Pride Rock as his dream home gone, he finds a new home near Pride Rock. When they enter the crowd, Timon pulls Pumbaa's tail which makes the animals pass out and appear to be bowing before the new-born prince. Timon and Pumbaa take their new home until it destroyed. They venture into the Elephant Graveyard and the gorge when they enter a wildebeest stampede. Timon, having survived a waterfall, gives up until he is awakened the next morning and sees a jungle that they make their new home. After a short period of time, they take young Simba in and raise him under the philosophy of "hakuna matata". When Simba grows into a full grown adult, he meets and falls in love with his old friend Nala causing Timon to think Simba's love for her will spell doom for his friendship with him. 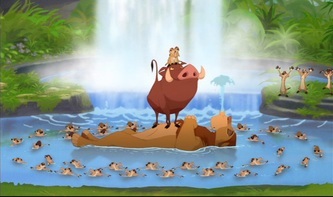 Along with Pumbaa, Timon tries several ways to stop the new couple "from feeling the love tonight" and fail. When awakened by Nala the next morning, she tells the two that Simba needs their help in order to defeat Scar. Thinking Simba ran out on him, he decides to stay behind which causes him to break his friendship with Pumbaa who wants to help. Rafiki indirectly talks sense into Timon and finds Pumbaa to restore his friendship with him. Timon along with Pumbaa, Ma, and Uncle Max defeat the hyenas thus helping Simba reclaim his rightful place as king. After Simba becomes king, he becomes a hero when he delivers his colony from the meerkat burrows into the lushful jungle he called home.